Many people have been reporting the voice memos missing issue on their iPhone/iPad. This problem goes way back to the iOS 12/11 upgrade and has been happening for a while now. A lots of reasons can cause your voice memos disappeared, prior to that however, it's important to know how to get back your memos back. This is also what we are going to be dealing with in this article. Now keep reading and learn 3 ways to easily retrieve voice memos from iPhone with or without backup. The exclusive technology ensures great chance that you can get back voice memos from iPhone. No matter how you lost voice memos from iPhone, D-Back can recover for you. You can preview and selectively recover the files you need, like voice memos in this article. 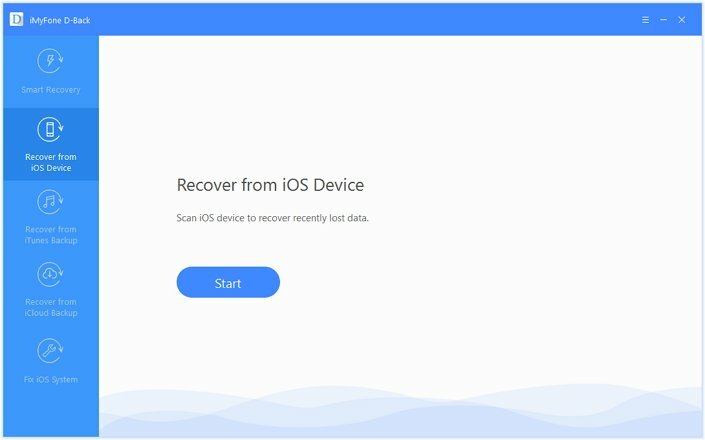 This wonderful iPhone data recovery software has been recommended by Cult of Mac, CNET, 9To5Mac and other famous technology sites. 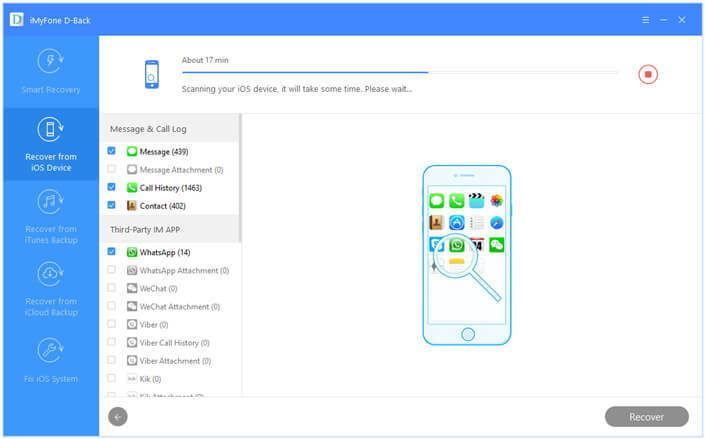 It can also extract data from iTunes backup and iCloud backup. Fully support iPhone XS/XS Max/XR/X/8/7/6/6s/5 running iOS 12.1/12/11/10. Stopping using your iPhone when you realized that the voice memos have gone will increase the chance to get them back. Step 1.Launch the program. From the primary window, click on "Recover from iOS device" and then click on "Start." Step 3.Wait for a few minutes to scan your device. 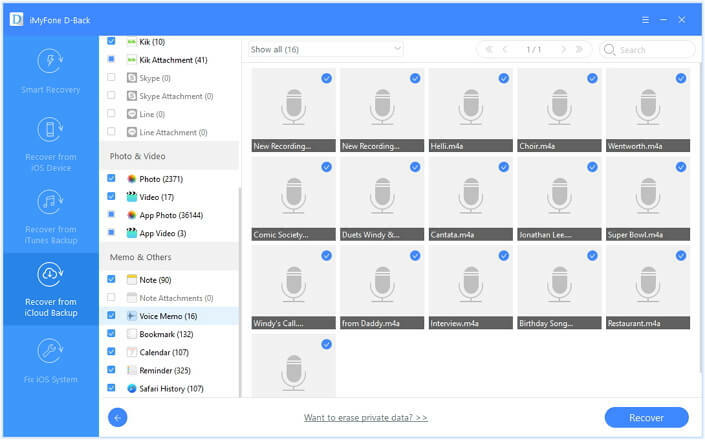 Step 4.When the scan is complete, preview the recoverable voice memos and select the missing voice memo. Click "Recover" and select a file path in the popup that appears. If you are lucky to have backed up voice memos in iTunes/iCloud, things will become easier. All you have to do to get them back is simply restore the device. To do this, you can either use the official way to restore voice memos to iPhone, or use iMyFone D-Back mentioned above. Each method stands out for reasons, and in the following part, we will discuss in detail. First, make sure you have backed up voice memos with iCloud/iTunes, then follow these simple steps to do it. Step 1: Launch iTunes on your computer and then connect the device using USB cables. Step 2. 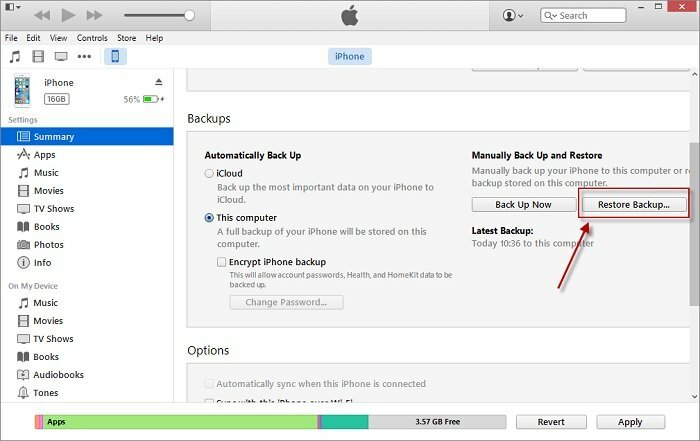 Select device when it appears in iTunes and then select "Restore Backup" in iTunes. Step 3. Choose the most relevant backup and click "Restore" to finish. Step 1. Go to Settings > General > Reset > Erase All Content and Settings. Step 2. Enter the passcode and confirm to erase iPhone. Step 3. Then select Restore from iCloud backup. 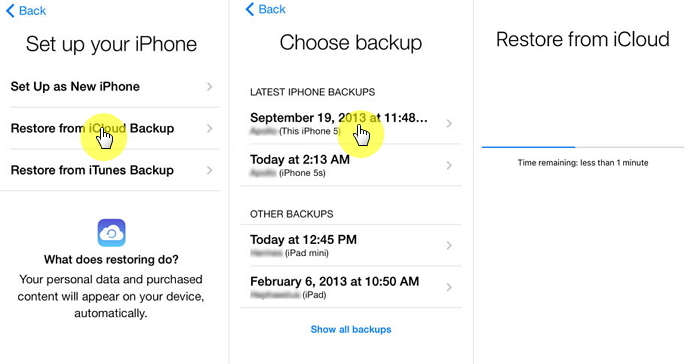 Login your iCloud account and select the backup file. Wait for the whole restore process finishes. 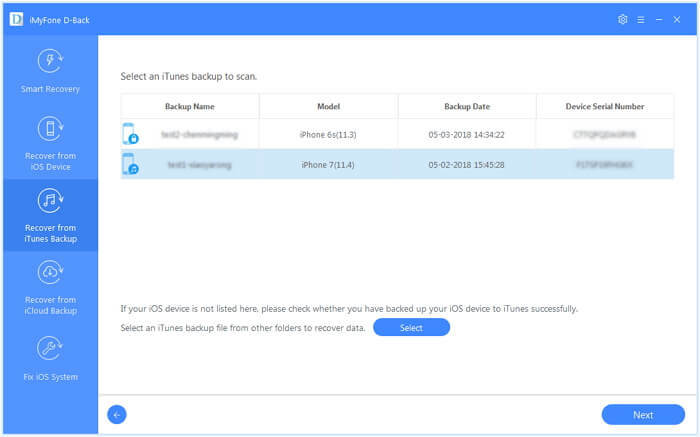 But you may noticed that both iTunes and iCloud will erase the current data on your iPhone and replace it with the backup files. 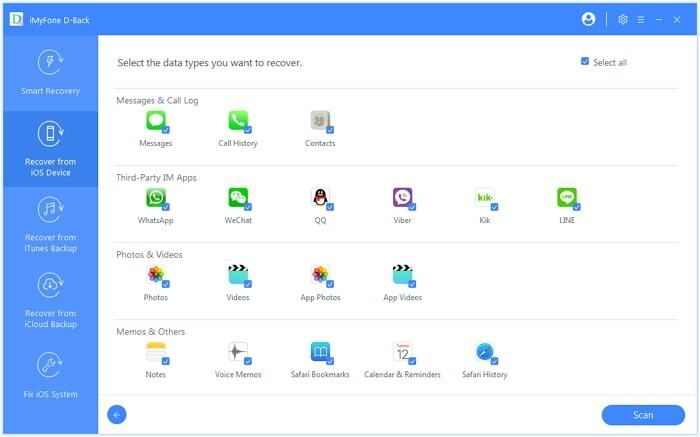 If you don't want to lose the data and just need to get a few voice memos back, you might as well employ the services with the iPhone backup viewing tool iMyFone D-Back. Unlike other programs, iMyFone D-Back will go a step further and actually help you extract the voice memos from the iTunes or iCloud backup file to computer. Here's how you can do that. But first, download and install the program on your computer and let's get started. When iPhone voice memos disappeared and you have made an iTunes backup in time, here is how to extrac and recover your memos. Step 1. Launch the program and from the main window, select "Recover from iTunes Backup" and then click on "Start." Step 2. Select the iTunes backup file that likely contains the missing voice memo and then click "Next". Step 3. Select "Voice Memo" as the file type you would like to recover. Step 4. Once the scanning process is complete (be patient, it could take a while), browse the recovered data to select the missing memo and then click "Recover." 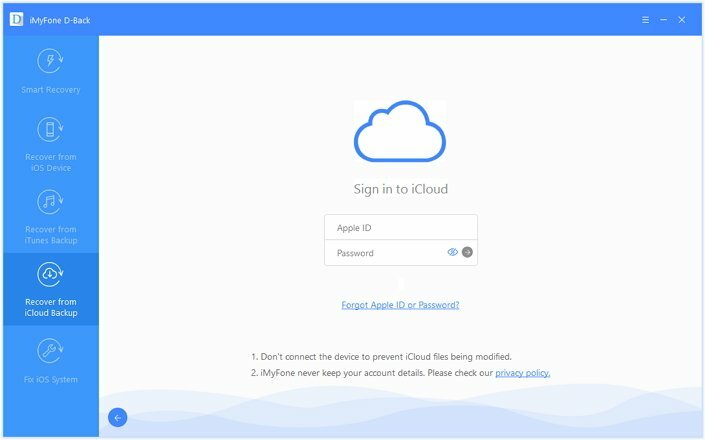 If your voice memo is in an iCloud backup file, follow this simple guide to get it back without having to restore the device completely. Step 1. From the main window, click on "Recover from iCloud Backup" and then click on "Start." Step 2. The next step is to sign in to your iCloud account. Enter your log in information to do so. Step 3. The program will detect all of the iCloud backup files on that account. Click on the one that may contain the memo and then click "Next" to download the file. Step 4. Select "Voice memo" since this is the file type we want to recover. Step 5. Once the download and scanning process are complete. Select the missing memo and then click "Recover." Here we have compared the features of 3 methods mentioned above. If you don't mind data loss, it's feasible to choose the official way. However, as it's clearly showed, using iMyFone D-Back is more convinent and will save a lot of trouble no matter you have backup file or not. The free trial it offers allows you to scan device and find if the missing voice memos are still there. After that, you can use the full verison to recover them.